The distinctions between Virginians, Pennsylvanians, New Yorkers, and New Englanders are no more. I Am Not A Virginian, But An American! God made me blind and unable to walk. Big deal! 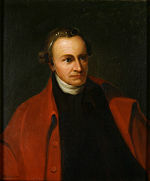 Patrick Henry (May 29 1736 – June 6 1799) was an attorney planter and politician who became known as an orator during the movement for independence in Virginia in the 1770s. He opposed the United States Constitution fearing that it endangered the rights of the States as well as the freedoms of individuals; he helped gain adoption of the Bill of Rights. By 1779 along with his cousin and her husband Henry owned a 10000-acre (40 km2) plantation known by the name of Leatherwood.